This review is long coming but I am a little glad that I waited. I do have to admit that I have found a hard time with anthologies and I never could figure out why. However, I am happy, no ecstatic to say Meet Cute is that one anthology that I throughly enjoyed and fell in love from the very first story until the very end. One of the greatest things about this read was the diverse case of authors, characters and stories that this book brought. My level of excitement continuously grew as I delved deeper and deeper into the book. It honestly felt like I was in a boy walking into a candy store for the first time. 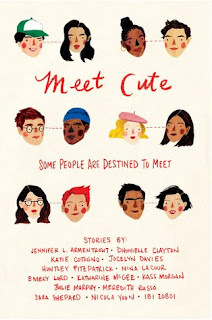 While reading I wondered if this what I do when I meet someone that I this is cute or attractive for the first time. Then, as I begin to ponder more on it all I could do was check off what the characters were doing and I was like, "Yep, I do that. Yep, I do that too. Oh boy, do I do that!" Overall I think this is the anthology that is going to push me to read more. I was captivated the whole time and it just felt nice to just get a glimpse of these characters. Are there stories where I wish there was more. Yes! But who wouldn't. If you are looking for that one book that is perfect for the Valentine season or just looking for a book that will make you fall in love over and over again, this is the book for you.